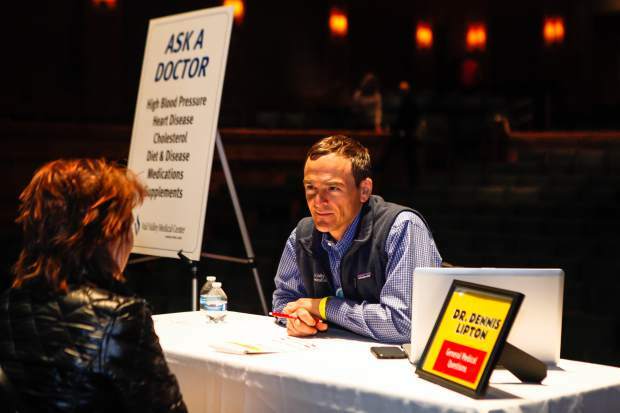 Dr. Dennis Lipton answers questions about various medical issues during the fifth annual All You Need is Heart through Starting Hearts on Wednesday in the Vilar Performing Arts Center in Beaver Creek. Questions with doctors, screenings, silent auction and vendors were also part of the event. BEAVER CREEK — Everyone dies of something, but it doesn’t need to be a heart attack before your time. Starting Hearts’ fifth annual All You Need is Heart event saw almost 200 cardiac screenings, along with doctors and nutritionists helping people understand that they really can help themselves. Starting Hearts promotes heart healthy behaviors such as proper nutrition, exercise and CPR training. “We would much rather promote that than worry about a body in the ground,” said Alan Himelfarb, executive director of Starting Hearts. Dr. Caldwell Esselstyn from the Cleveland Clinic Wellness Center, and author of “Prevent and Reverse Heart Disease,” explained how we get cardiovascular disease. “We have made a billion-dollar industry in this country from an illness that doesn’t even exist on half the planet,” Esselstyn said. They don’t have cardiovascular disease, he said. “Why? Because they all thrive on whole food, plant-based nutrition,” Esselstyn said. After completing his medical training, Esselstyn spent a year as a combat surgeon with U.S. forces in Vietnam. He learned that 8 percent of those 20-year-olds had evidence of cardiovascular disease. Another study 45 years later showed the disease is now ubiquitous. “You graduate from high school, you get a diploma and you also get a foundation for heart disease,” Esselstyn said. Sometimes, plant-based nutrition is forced upon people. During World War II, the Axis powers overran the low countries of Holland and Belgium, and occupied Denmark and Norway. The Germans took away all of the livestock to feed their troops. “Suddenly these western European nations were plant-based,” Esselstyn said. A series of medical studies found that from 1927 to 1939, stroke and heart disease increased. The Germans invaded, took all of the animals and people who were left alive, were forced to eat a plant-based diet. Instances of stroke and heart disease plummeted. In 1945, Hitler died and the war ended. 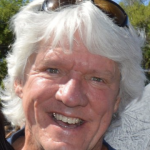 “Back comes the meat, back comes the dairy and back come the strokes and the heart attacks,” Esselstyn said. It’s biochemistry, which sounds complicated but really isn’t, Esselstyn explained. “Changing your biochemistry means changing your food,” Esselstyn said. When you eat foods such as cheeseburgers and milkshakes, your arteries become lined with stuff that makes them sticky. They clog. When you switch to whole food plant-based nutrition, you stop that cascade where your arteries become sticky. Eventually, you’ll make yourself heart attack proof, Esselstyn said. The entire heart attack proofing process is optimized whole food plant-based nutrition, Esselstyn said. “If I do my job correctly, every one of you should be able to make yourselves heart attack proof,” Esselstyn said.